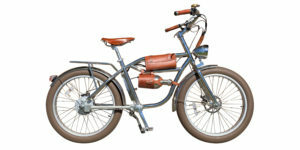 The C-Class is a mid-sized electric cargo/utility bike with classic cruiser styling. 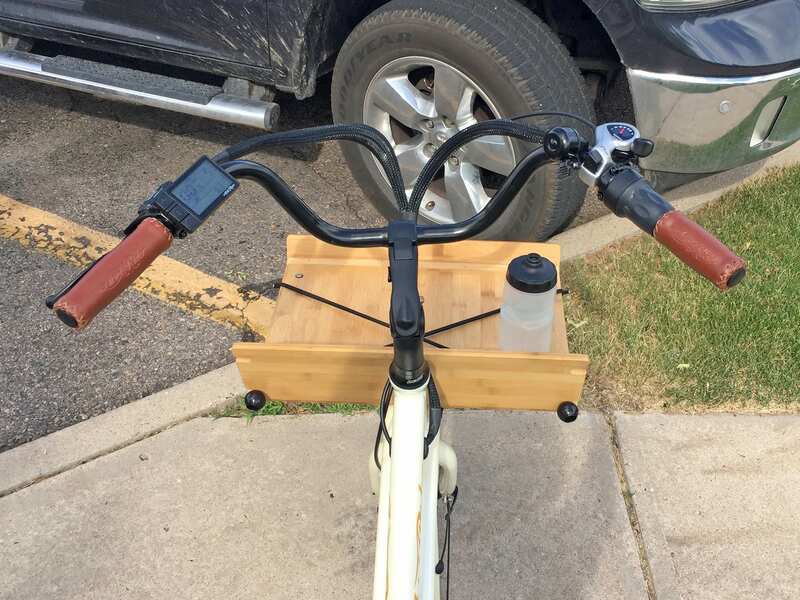 Two curving tubes run in parallel, all the way from the back of the rear rack to the front of the bamboo platform and headlight mount. With three sections of tubing to reinforce the mid-section of the bike, frame flex is minimized while allowing for lower stand-over height. 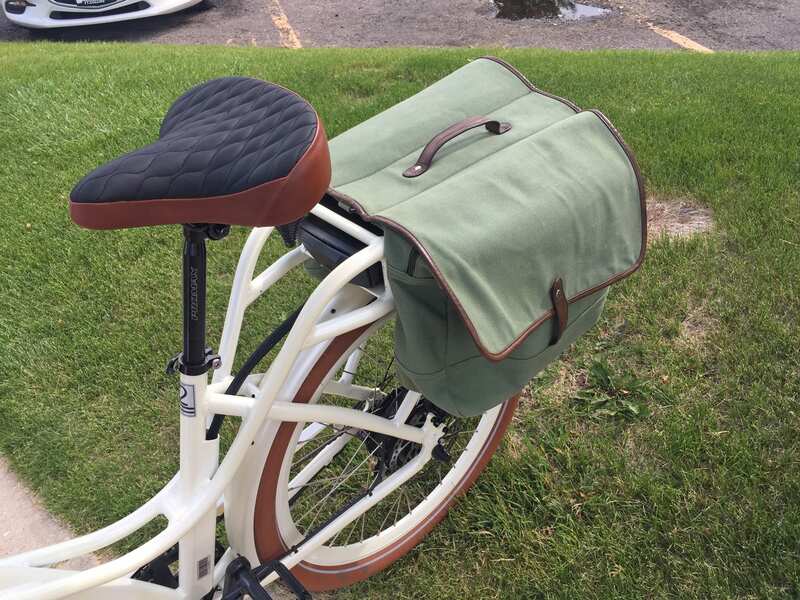 The step-thru frame is approachable and surprisingly capable… I was told by the founder that it can handle up to 400lbs in total, with up to 180lbs on the rear rack and up to 65lbs on the front rack. That’s way above average! 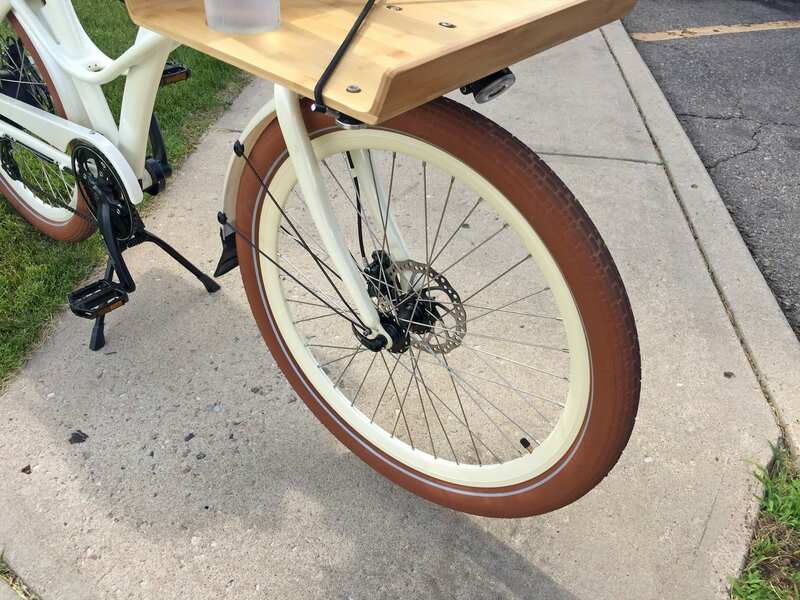 Part of what makes the bike so sturdy and approachable are its 26-inch wheels (verses 27.5″ or 28″) that lower the frame a bit, its deeper rims which shorten spoke length, and the thickness of the spokes themselves. 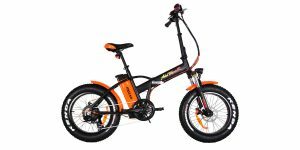 Shorter, thicker spokes tend to be very durable, and the smaller wheel diameter provides a mechanical advantage for the rear hub motor, which is already very powerful. 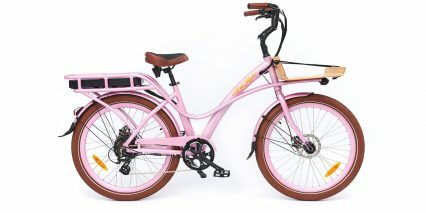 You do lose a bit of comfort with such sturdy/stiff wheels and spokes, but that is addressed quite well by the 2.35″ wide balloon tires from CST, padded faux-leather grips, longer swept-back handlebar, and large sprung saddle. 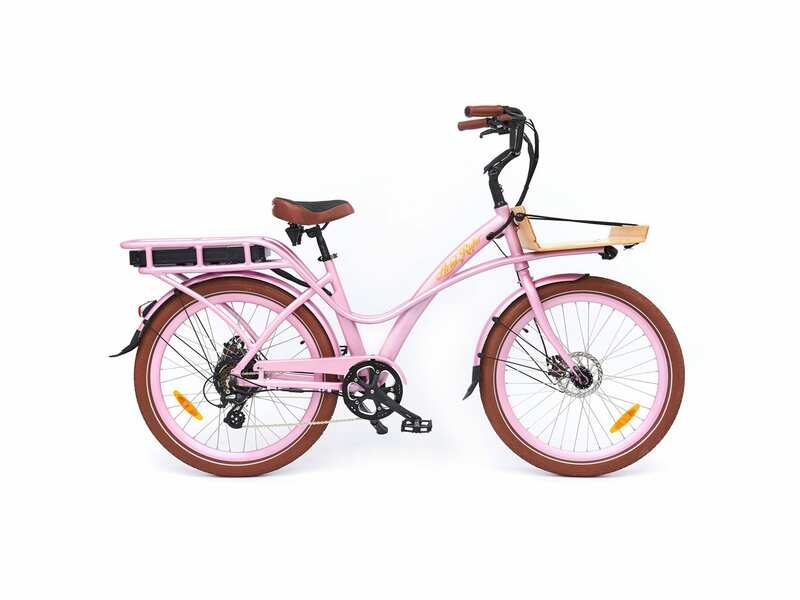 Even though this product is only made in one frame size, the seat can be positioned quite low and the bars can be oriented easily with the tool free adjustable stem. This stem is actually raised up a bit, to provide an upright body position and possibly to reduce the potential for contact with cargo on a fully loaded front rack. 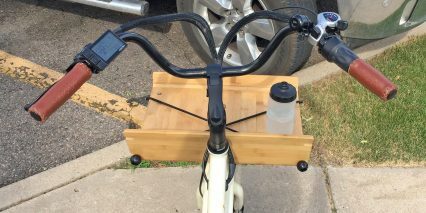 The platform rack that Ariel Rider chose for this e-bike is made from bamboo, and there are cutouts in the center for managing shifter, brake, and electrical wires, as well as cutouts at the corners for bungee attachments. There’s even a circular cutout for placing a coffee cup or water bottle, as demonstrated in the video review above. The C in C-Class stands for City and Cargo, but I feel that it could also stand for Cruiser. 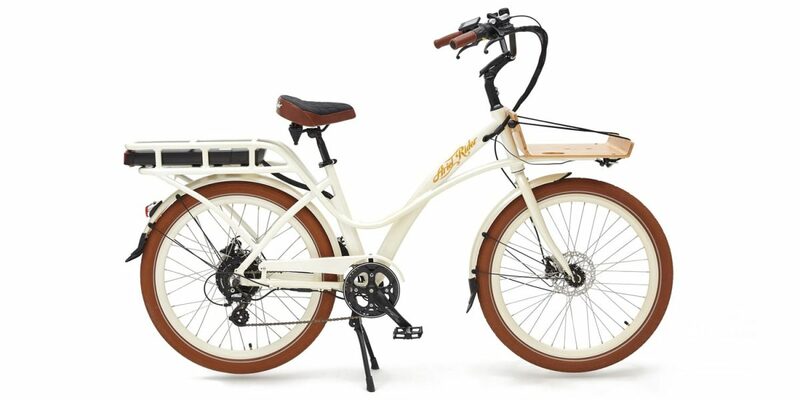 This is an electric bike that is capable of wearing many hats, so to speak, and it’s priced extremely well at just $1.7k. 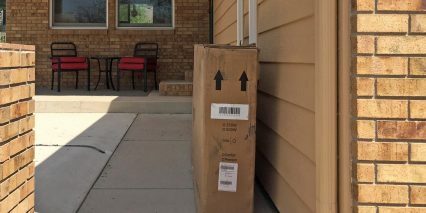 The company mainly sells direct, so you’ll have to do some unboxing and assembly as we did. I thought it went pretty well overall but was definitely thankful for Arda’s help (he’s the founder of Ariel Rider) because he’s quite fit and strong. 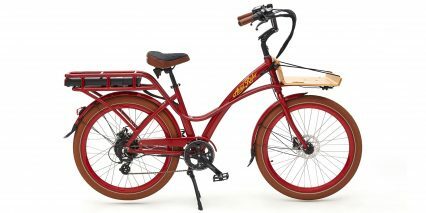 Weighing in at roughly 66.2lbs, the C-Class is 10 to 15lbs heavier than most of the other products I review… and that’s due to the extra tubing and racks (the bamboo deck), front and rear fenders and chain cover, larger tires, and high capacity battery. You’ll shave 7.7lbs off of the weight by simply removing the battery, which is easy to do for charging and safe keeping. All things considered, I was impressed with the bike’s performance, and delighted with the four bright color choices. Especially the Ivory, which would stand out best in dark environments. 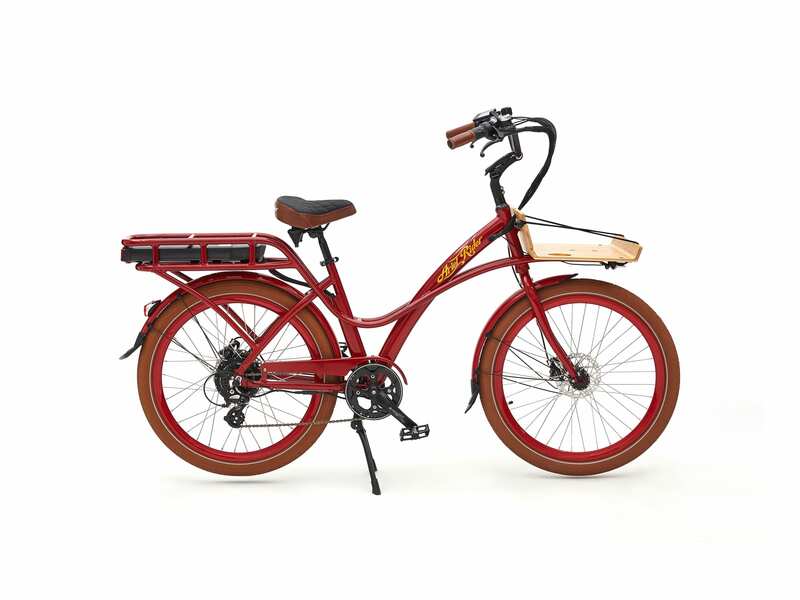 Driving this bike is a 500 watt nominal, 900 watt peak, planetary geared hub motor from Dapu. Despite its relatively compact size, this motor puts out a lot of power, up to 75 newton meters of torque! 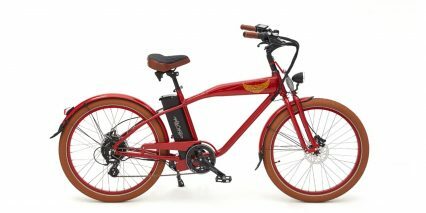 However, it feels natural to accelerate when pedaling because the motor controller uses a torque sensor vs. a simple cadence sensor. 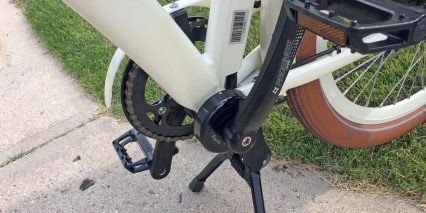 The sensor itself is contained in a small circular metal enclosure on the left side of the crank spindle, at the bottom bracket. It should hold up well here, and not get bumped around or dirty when riding. 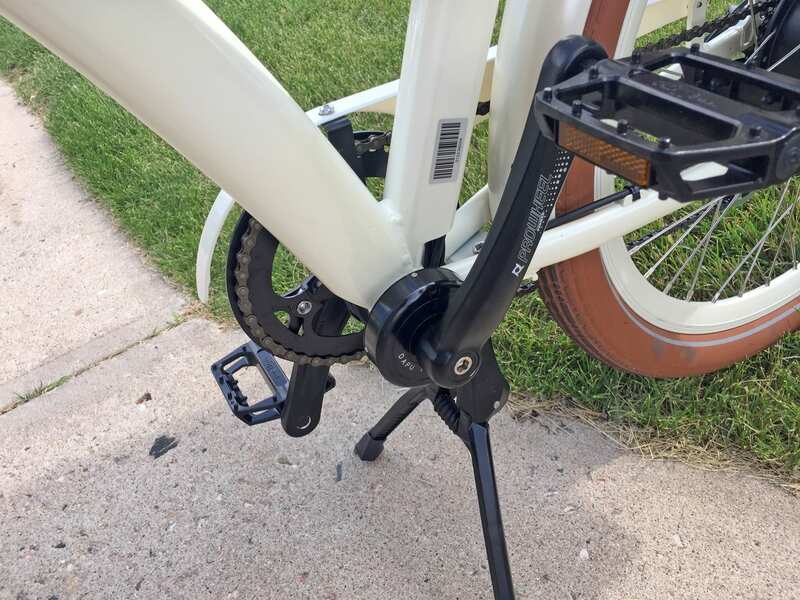 Ariel Rider chose well with the large alloy Wellgo platform pedals because they provide the stability and strength needed for loaded riding. 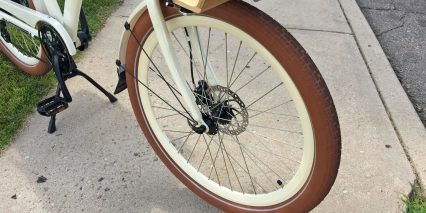 I appreciate the alloy chainring protector on the right side and narrow composite chain cover to keep your pants or dress ends clean. The mounting arm for this protector doubles as a guide, so chain drops shouldn’t be an issue… but it would be nice if an actual guide or second alloy plate could be added to the chainring for reassurance. Back to weight vs. performance vs. cost though… The company did choose a slightly upgraded derailleur, Shimano Altus is one step up from entry-level and the 7-speed 11-36 tooth cassette offers good pedaling options for climbing moderate hills and reaching 20+ miles per hour. The C-Class ships with a 20mph top speed limit, but owners are able to enter into the settings by double tapping the power button once the bike is on and entering the four digit password (1919) to either lower or raise the maximum speed, making this a Class 2 or Class 3 product. I suppose that you could even remove the twist throttle by unplugging it, and then ride as Class 1. 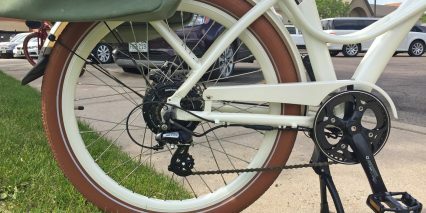 My one major gripe about the drivetrain is that the shifter mechanism is large, a bit slow, and sometimes difficult to reach. 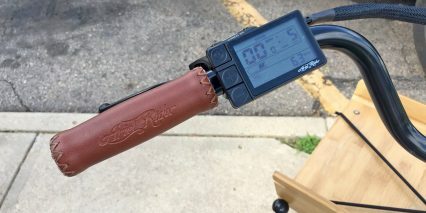 Ariel Rider (and many other companies) opt for this shifter because it leaves more space for twist throttles and their accompanying housing and cable feeds. Having a throttle is nice when you’re trying to balance a heavy load, it comes in handy for stop signs and traffic signals… where you need an instant boost to get started, but heavy use will use more power and eat into your range. 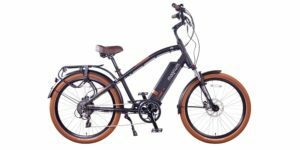 The hub motor is from Dapu, a brand that I have seen on Pedego and Easy Motion electric bikes, which I view as being higher quality. It does make some electronic whirring noises, as most geared motors do, but isn’t as loud as some. 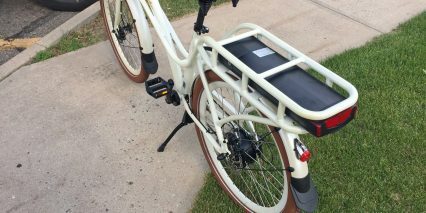 Powering the bike is a rear-rack mounted battery pack containing lithium-ion cells from LG. It comes with a one year warranty, and all other parts get 2+ years of coverage. 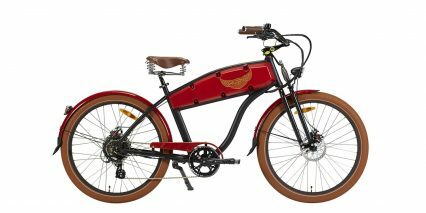 Ariel Rider has been around for several years now, and I’ve reviewed many of their older products. It’s a smaller company, but one that is run well and continually improved. 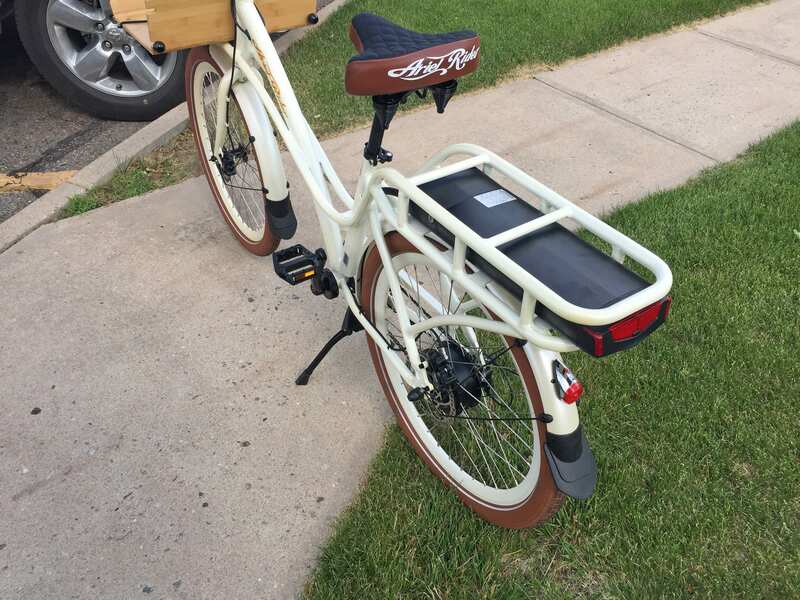 This battery is a good example, because it’s so compact and well-integrated on the rear rack. The weight isn’t too bad when you look at the 48 volt 12.6 amp hour capacity (604.8 watt hours total), which is well above average for the 2018 season. You don’t have to leave the key in this battery in order to power it on, as you do with some of the mid-frame batteries from Ariel Rider, and it has an integrated LED tail light! 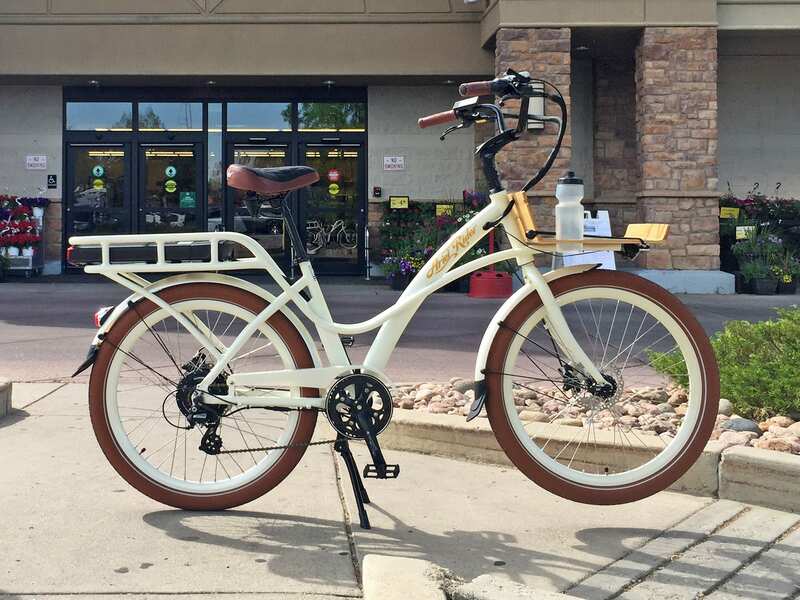 There are definitely some trade-offs when it comes to rear rack batteries, weight distribution is the primary consideration, but it does free up the main section of frame to be lower and narrower. 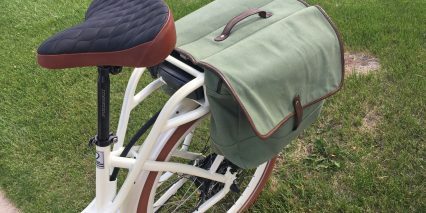 If you opt for one of the canvas pannier bags that the company sells, the battery almost completely disappears from view! 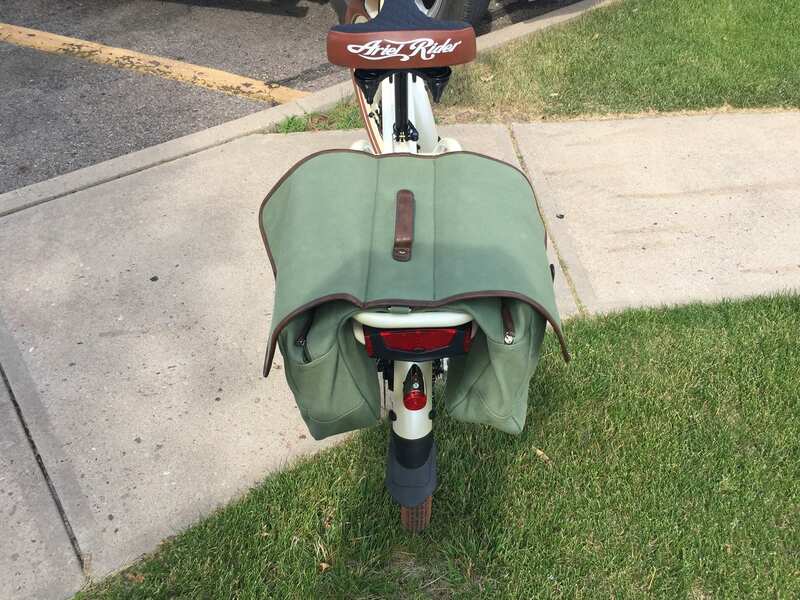 Keep in mind, not all panniers will work with this rack, because the tubing is so thick and sturdy. 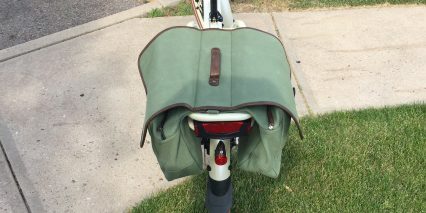 Many clip-on panniers require narrower tubing, so I’d stick with the Ariel Rider options or maybe use a trunk bag on top. 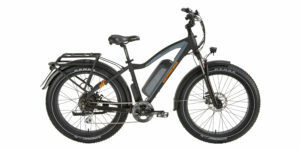 The battery powers the motor, backlit LCD display, and three integrated lights on this ebike, but it does not offer a USB charging port. Filling the pack may take a bit longer due to the basic 2-amp charger, but at least it’s lightweight and fairly compact. Finally, I appreciate how discrete most of the cables are here, they are internally routed through the frame in many places and wrapped with plastic mesh for protection and organization when exposed. 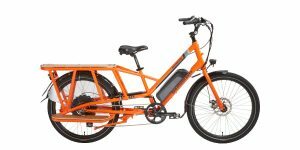 Operating this ebike is fairly comfortable and intuitive. The display panel is clean and compact, with only three buttons to interact with. It isn’t removable, so it could take some damage at public racks, but it will swivel to reduce glare if you don’t over-tighten the mount. Once the battery pack is charged up and mounted to the frame, just hold the little power button at the top left corner of the display to power it on. 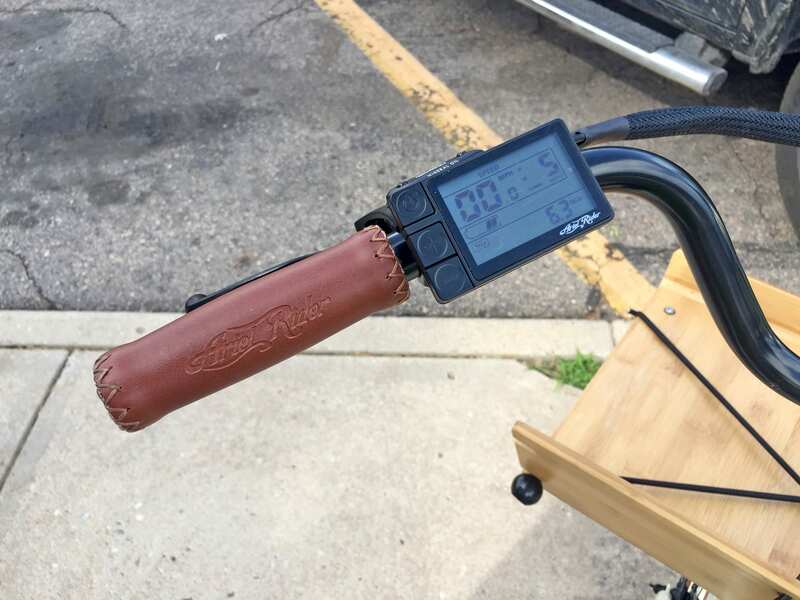 The monochrome readout blinks on fairly quickly, showing your current speed, power meter, assistance level (0-6), battery charge level, and some trip stats below. You can change the readouts by tapping the power button once, and this will show average speed, max speed, odometer, and trip time. Most of your interaction will probably be clicking the plus and minus keys to raise or lower the pedal assist level. I love how the throttle can override the different assist levels for a quick boost of power and speed. That said, it’s always hot, so you could get an unexpected boost when loading, mounting, or dismounting. 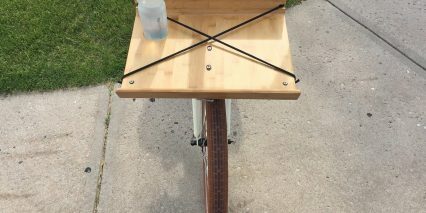 During the ride tests, I pulled the handle bars up and back using the tool-free adjustable stem for a more upright body position and that also made the display closer and easier to read. It’s nice that the wire for this display was long enough to accommodate such big comfortable bars! You can activate the display backlighting by holding the + button and activate walk mode by holding the – button (for 7 km/h 3.7 mph assistance). 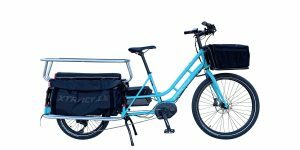 Walk mode is nice to have if you’ve got fully loaded racks or child seat on the back. Again, the bike is fairly heavy as-is. For those who are interested in child seats, the Yepp Nexxt Maxi would work because it clamps from the sides. There are even more settings to explore in the menu system by double tapping the power button, as mentioned earlier. This is where you can change units, adjust backlight brightness, and raise or lower the top speed by entering password 1919 at the last screen. 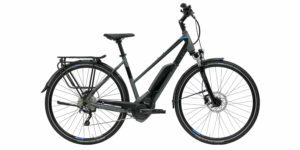 While shooting this review, I also got to test ride some of the other models from Ariel Rider, including the M-Class, which is a compact ebike that’s also capable of hauling some cargo. 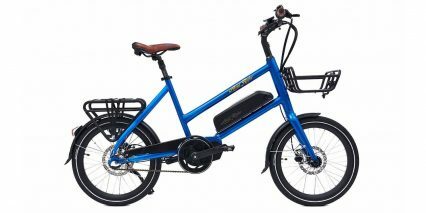 I was told that the bikes are manufactured in the same facility as Vanmoof, Tern, CUBE, and BH/Easy Motion, which makes sense given the higher quality drive system, battery, and controller unit. I really appreciate how Ariel Rider has managed to keep the price low here without sacrificing too much in the way of performance and quality. There’s definitely some frame flex and weight distribution trade-offs, but the frame is approachable. The drivetrain should hold up alright, but doesn’t shift as fast or offer a super wider range with special clutch features and dedicated chain guides. The lights are great but the headlight isn’t super visible under the bamboo deck and cannot be aimed perfectly (it aims down mostly). 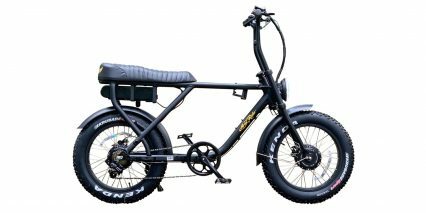 The main things have been done well, including the double leg kickstand for stable loading, the frame mounted racks, and the powerful hydraulic disc brakes with motor inhibitors. Part of me would love to see two 180mm rotors vs. a 180mm in the rear and 160mm up front, and I did mention this to Arda. 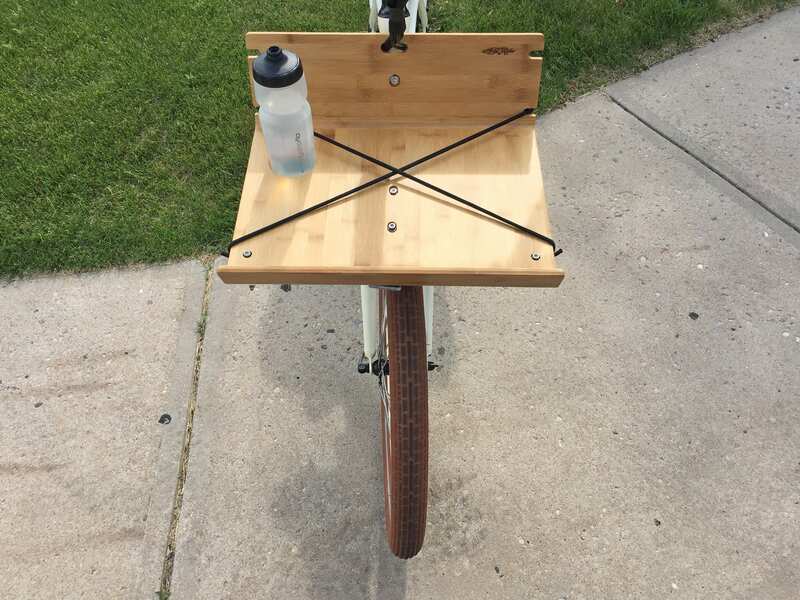 He explained that since the rear rack is capable of supporting the heaviest loads, they chose to upgrade that one. Arda and his brother are from Turkey, you may notice their accents in the video! They have earned my trust and inspired me with a story about how a family member passed away due to health conditions, inspiring them to focus their careers on health and sustainability. 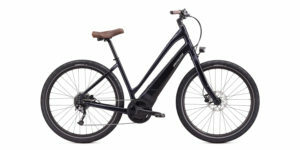 At the end of the day, this ebike is comfortable and capable. It can feel a bit odd to turn and not see your front wheel due to the frame-mounted rack, but there wasn’t any frame wobble, the fenders looked very nice and did not produce a lot of rattling (despite being plastic composite), and I never felt imbalance when mounting or stepping down because of how low the frame and tubing design are. 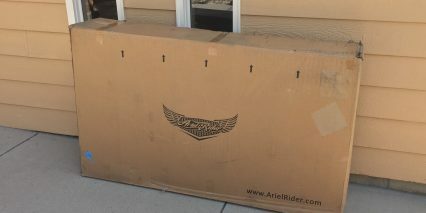 As always, I welcome questions and feedback in the comments section below and in the Ariel Rider forums. 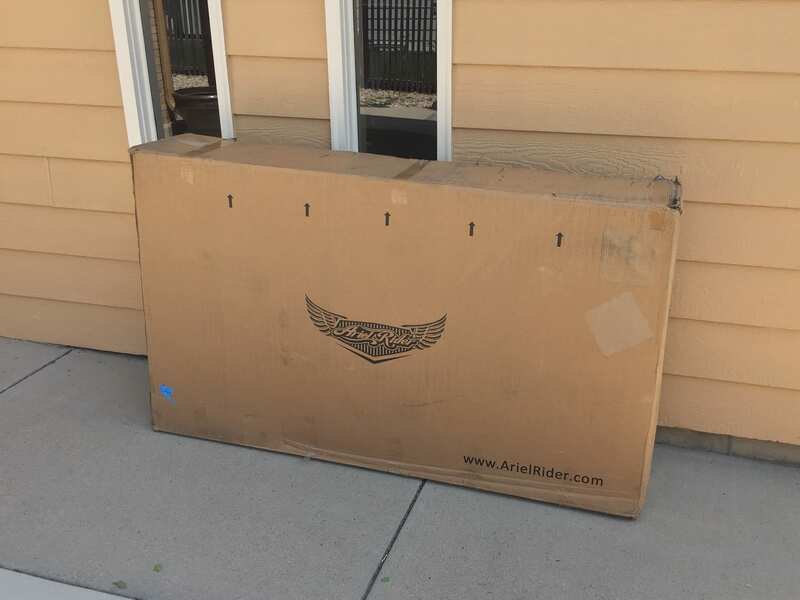 Big thanks to Ariel Rider for partnering with me on this review and actually shipping a bike out so we could assemble and test together. It was cool to see the included touch up paint, none of the frame was damaged or even scratched, and assembly was fairly straightforward. One final heads-up, if you mount the saddle all the way down, the springs below may collide with the rack tubing and scratch the paint… in that case, try moving the saddle all the way forward and raising it just an inch off of the seat tube (leaving a gap of one inch vs. all the way down) to minimize contact. Hey, Mike! Thanks for chiming in with the warning about direct order products. 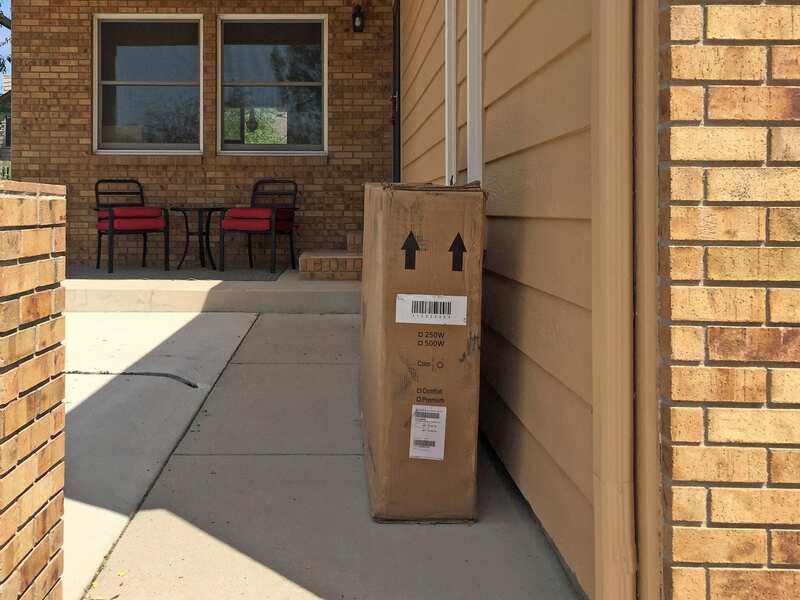 It’s true, there’s usually some extra hassle to deal with and I almost always see damage to the box… your point about shipping on pallets is a great one! 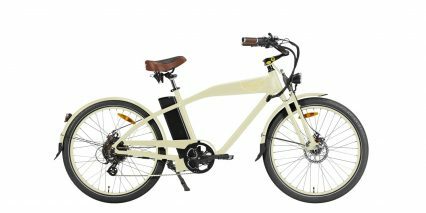 and that makes sense for why ebikes in shops are usually undamaged vs. individually delivered ones. 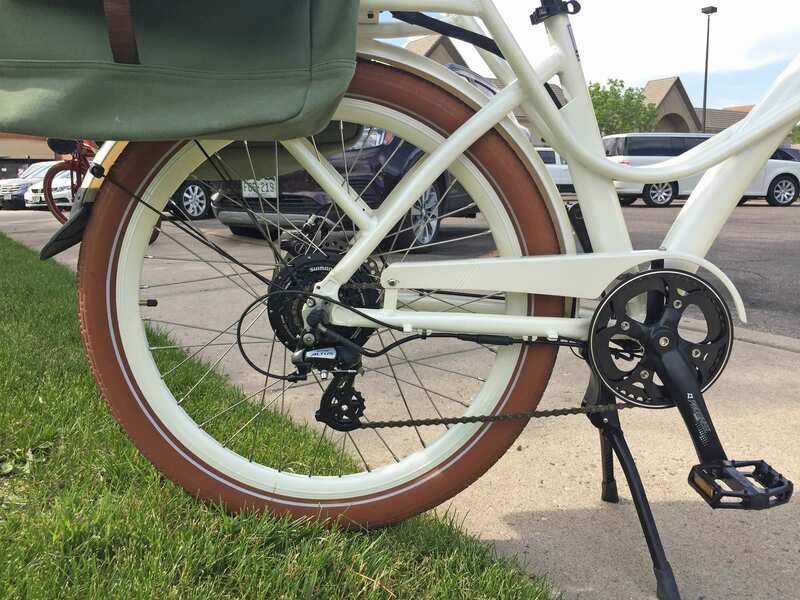 When you start out with a degraded product (wheel untrue and derailleur out of tune) it can impact the entire life of the bike… and the time and repair service can indeed exceed that initial cost savings. Good point about shops not wanting to help with repairs for products that they did not sell, sometimes they simply don’t have the parts on hand. I’ll try to call this out more in the future but feel that your writeup here is very thoughtful and objective. Thanks for keeping a cool head… maybe post this in the EBR forums under the guides/resources section (and feel free to elaborate) and I’ll add a video to give it some additional interest. For this particular review, I thought the C-Class arrived in exceptionally good shape and was happy for Arda and his brother Berk to see that nothing had been damaged along the way. Both of the other bikes were brought pre-assembled by them for this visit, so I cannot say what condition they were in when arriving from Asia (where most ebikes are manufactured). 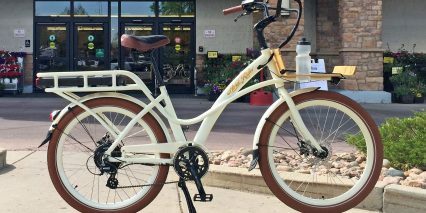 The introduction of Velofix and Beeline can aid in the process of assembly and post-purchase service, but I do tend to recommend local shops as the best point of purchase, and almost always go that route for myself. regarding Mike’s comments. He is obviously a dealer. Which is ok. 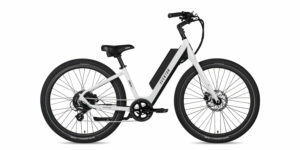 But what alternative do ebike buyers have when they there are no dealers that sell them where they live? 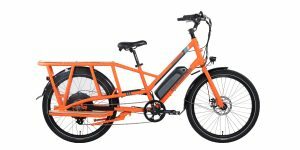 I live in the metro Atlanta area, and there are pracitcally ZERO ebike dealers here. So what do we do? We dont’ have a choice but to take the chance and buy online.